A man running from police jumped off the Van Buren overpass onto the inbound Kennedy Expressway, authorities said. 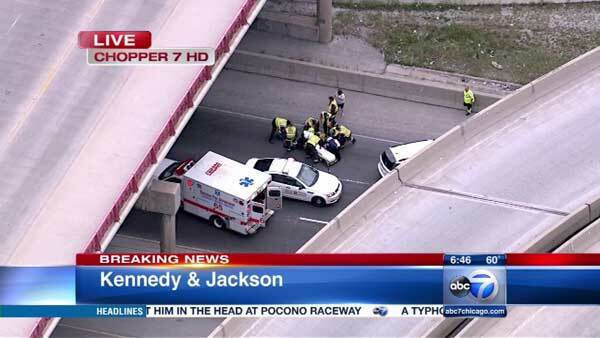 CHICAGO (WLS) -- A man jumped off the Van Buren overpass onto the outbound Kennedy Expressway during rush hour Tuesday morning. Emergency vehicles were seen blocking all lanes around 6:40 a.m. Drivers used the shoulder to get by. The man was taken to the hospital. His condition is unknown, but he did survive the fall. Authorities did not release his age. All lanes of the outbound Kennedy reopened around 7:15 a.m. Traffic delays lingers on area expressways for hours. Illinois State Police initially said the man was running from Chicago police officers, but CPD later said he was not being chased.